Kindervital Fruity Formula is a delicious tasting food supplement which provides calcium and nine essential vitamins. 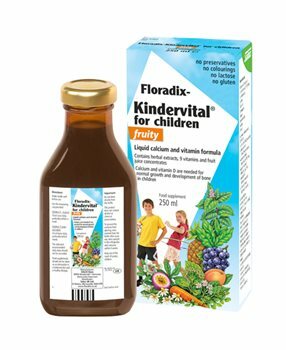 It is an ideal multivitamin with calcium product to help maintain health and vitality in children whose diet may be deficient in some of the goodness that they need. As all nutrients are already dissolved in a liquid formula, the vitamins and calcium can easily be absorbed by the body. Calcium lactate, calcium gluconate, natural flavours, thickener: guar flour and xanthan, calcium phosphinate, vitamin C, nicotinamide, vitamin E (D-alpha-tocopheryl acetate), vitamin B2 (riboflavin sodium phosphate), vitamin B6 (pyridoxine hydrochloride), vitamin B1 (thiamine hydrochloride), vitamin A (retinyl palmitate), vitamin D (colecalciferol), vitamin B12, maltodextrin.